رمضانی, طاهره, حسینی المدواری, سید محمود, فلاح زاده, حسین, دهقانی تفتی, عارفه. (1396). نوع و میزان خطاهای دارویی و علل آن از دیدگاه پرستاران شاغل در بخش‌های نوزادان و مراقبت‌های ویژه نوزادان بیمارستان‌های استان یزد در سال1393. سلامت جامعه, 10(1), 63-71. طاهره رمضانی; سید محمود حسینی المدواری; حسین فلاح زاده; عارفه دهقانی تفتی. "نوع و میزان خطاهای دارویی و علل آن از دیدگاه پرستاران شاغل در بخش‌های نوزادان و مراقبت‌های ویژه نوزادان بیمارستان‌های استان یزد در سال1393". سلامت جامعه, 10, 1, 1396, 63-71. رمضانی, طاهره, حسینی المدواری, سید محمود, فلاح زاده, حسین, دهقانی تفتی, عارفه. (1396). 'نوع و میزان خطاهای دارویی و علل آن از دیدگاه پرستاران شاغل در بخش‌های نوزادان و مراقبت‌های ویژه نوزادان بیمارستان‌های استان یزد در سال1393', سلامت جامعه, 10(1), pp. 63-71. 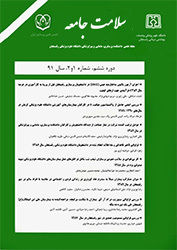 رمضانی, طاهره, حسینی المدواری, سید محمود, فلاح زاده, حسین, دهقانی تفتی, عارفه. نوع و میزان خطاهای دارویی و علل آن از دیدگاه پرستاران شاغل در بخش‌های نوزادان و مراقبت‌های ویژه نوزادان بیمارستان‌های استان یزد در سال1393. سلامت جامعه, 1396; 10(1): 63-71. مقدمه: دارو دادن و خطاهای دارویی در کودکان به خصوص نوزادان از اهمیت ویژه‌ای برخوردار است. این مطالعه با هدف تعیین نوع و میزان خطاهای دارویی و علل آن از دیدگاه پرستاران شاغل در بخش‌های نوزادان و مراقبت ویژه نوزادان صورت گرفته است. مواد و روش­ها :در این مطالعه­ توصیفی- مقطعی که در سال 1393 انجام شد، نمونه‌گیری به صورت سرشماری نمونه­ها و شامل 180 پرستار شاغل در بخش‌های نوزادان و مراقبت ویژه نوزادان، در10 بیمارستان یزد بودند. ابزار گردآوری داده­ها، پرسشنامه اطلاعات جمعیت‌شناسی و پرسشنامه "خطای تجویز دارو"برای تعیین میزان خطاهای دارویی و انواع خطاهای دارویی بود. اطلاعات جمع­آوری شده با استفاده از آمار توصیفی (فراوانی،میانگین و انحراف معیار) و آمار استنباطی (آزمون T و پیرسون) در نرم‌افزار20 spss مورد تجزیه و تحلیل قرار گرفت. یافته‌ها: 20 درصد از پرستاران عنوان کرده بودند که در طول شش ماه گذشته مرتکب خطای دارویی نشده­اند و 45 درصد از آن‌ها بین 1 تا 2 خطای دارویی داشتند. خطاهای دارویی در داروهای تزریقی به ترتیب شامل اشتباه در زمان دارو دادن (51% تا60%)، اشتباه در محاسبات دارویی (51 % تا 60%) ، دوز دارویی (41% تا 50%) و سرعت تزریق دارو (41% تا 50%) بود. خطاهای دارویی در داروهای غیر تزریقی شامل اشتباه در محاسبات دارویی (51% تا60%) و پس از آن اشتباه در دوز دارویی (41% تا 50%) بود. همبستگی بین خطاهای دارویی تزریقی و غیر تزریقی نشان داد که خطا در داروهای قابل تزریق بیشتر روی می‌دهد و مهم‌ترین علت خطاهای دارویی کمبود نیروی انسانی بود. نتیجه‌گیری: احتمال بروز خطاهای دارویی در پرستاران زیاد است کلاس های بازآموزی در ارتباط با اطلاعات داروشناسی و اصلاح فرایند آموزش، تشویق و ترغیب پرستاران در جهت گزارش دهی اشتباهات دارویی و واکنش مثبت مدیران پرستاری پیشنهاد می شود. 1PhD. Candidate of Nursing, Faculty Member of Kerman University of Medical Sciences, Razi school of Nursing & Midwifery, Department of Public Health. Kerman, Iran. Introduction: Medication and medication errors are very important in children, especially in neonates. This study is aimed to determine the level and the type of medication errors and their causes of Working Nurses’ Perspectives in Neonatal Units and Neonatal Intensive Care Units. Material and Methods: The present research was a descriptive cross-sectional study. The method of sampling was census and included 180 nurses working in the neonatal units and neonatal intensive care units in 10 hospitals of Yazd. The data collection tool was questionnaire. The first questionnaire contained the demographic data. The second questionnaire was “Medication Administration Error” in order to determine the level and types of medication errors). The collected data were entered into the SPSS statistical software (v. 20) and analyzed using descriptive statistics (frequency, mean, and standard deviation) and inferential statistics (t-test, and Pearson correlation statistics). Results: twenty percent of the nurses indicated that during the last 6 months they did not commit medication errors and 45% had between 1 to 2 medication errors. Medication errors in injection drugs respectively included; errors in the time of administration of medication (51% to 60%), errors in pharmaceutical calculations (51% to 60%), wrong dose of a drug (41% to 50%) and medication errors in non-injection medications included in medication calculations (51% to 60%) and after that errors in medication dose (41% to 50%). Correlation between injection and non-injection medication showed that errors occur mostly in the injection drugs .The most important causes of medication errors were lack of adequate resources. Conclusion: Since the risk of medication errors among nurses are high, retaining courses on pharmacological information, modification of educational curriculum, encouraging nurses to report medical errors and also encouraging hospital managers to give positive response to errors are suggested. Stetina P, Groves M, Pafford L. Managing medication errors-a qualitative study. Medsurg Nursing 2005;14(3):174-8. Stratton KM, Blegen MA, Pepper G, Vaughn T. Reporting of medication errors by pediatric nurses. Journal of pediatric nursing 2004;19(6):385-92. Kohn LT, Corrigan JM, Donaldson MS. To err is human: building a safer health system. 9nd ed. Institute of Medicine (US) Committee on Quality of Health Care in America : Washington (DC):National Academies Press(us); 2000: 122-8. Bates DW, Cullen DJ, Laird N, Petersen LA, Small SD, Servi D, et al. Incidence of adverse drug events and potential adverse drug events: implications for prevention. Jama 1995;274(1):29-34. Hughes RG, Ortiz E. Medication Errors: Why they happen, and how they can be prevented. Journal of infusion nursing 2005;28(2):14-24. Hansen RA, Greene SB, Williams CE, Blalock SJ, Crook KD, Akers R, et al. Types of medication errors in North Carolina nursing homes: a target for quality improvement. The American journal of geriatric pharmacotherapy 2006;4(1):52-61. Lehmann CU, Conner KG, Cox JM. Preventing provider errors: online total parenteral nutrition calculator. Pediatrics 2004;113(4):748-53. Campino VA, López HM, García FM, López dHGI, editors. [Medication prescription and transcription errors in a neonatal unit]. Anales de pediatria (Barcelona, Spain: 2003) 2006; 64(4):330-5. Johnson JA, Bootman JL. Drug-related morbidity and mortality: a cost-of-illness model. Archives of internal medicine 1995;155(18):1949-56. Thomas EJ, Studdert DM, Newhouse JP, et al. Costs of medical injuries in Utah and Colorado. Inquriy.1999;36(3)255-64. Simpson J, Lynch R, Grant J, Alroomi L. Reducing medication errors in the neonatal intensive care unit. Archives of Disease in Childhood-Fetal and Neonatal Edition 2004;89(6):F480-F2. Kaushal R, Bates DW, Landrigan C, McKenna KJ, Clapp MD, Federico F, et al. Medication errors and adverse drug events in pediatric inpatients. Jama 2001;285(16):2114-20. Wakefield BJ, Uden-Holman T, Wakefield DS. Development and validation of the medication administration error reporting survey 2005; 4(12):475-89. Lisby M, Nielsen LP, Mainz J. Errors in the medication process: frequency, type, and potential clinical consequences. International Journal for Quality in Health Care 2005;17(1):15-22. Ross L, Wallace J, Paton J. Medication errors in a paediatric teaching hospital in the UK: five years operational experience. Archives of disease in childhood 2000;83(6):492-7. Grissinger MC, Kelly K. Reducing the risk of medication errors in women. Journal of Women's Health 2005;14(1):61-7. Chedoe I, Molendijk HA, Dittrich ST, Jansman FG, Harting JW, Brouwers JR, et al. Incidence and nature of medication errors in neonatal intensive care with strategies to improve safety. Drug safety 2007;30(6):503-13. Tang FI, Sheu SJ, Yu S, Wei IL, Chen CH. Nurses relate the contributing factors involved in medication errors. Journal of clinical nursing 2007;16(3):447-57. Lope DM, Neri ED, Madeira Ldos S, Souza Neto PJ, Lelis AR, Souza TR. A quality assurance study on the administration of medication by nurses in a neonatal intensive care unit.Sangapor Med 2009; 50 (1):68-72. ITO H, YAMAZUMI S. Common types of medication errors on long-term psychiatric care units. International Journal for quality in health care 2003;15(3):207-12. Roseman C, Booker JM. Workload and environmental factors in hospital medication errors. Nursing research 1995;44(4):226-30.